Ubisoft announced today that the first episode of Assassin’s Creed III‘s The Tyranny of King Washington downloadable content will be released for the Xbox 360 and PC on February 19th, and on the PlayStation 3 on February 20th. A launch date for the Wii U version was not announced, however, Ubisoft did confirm that DLC will be released for Nintendo’s console. 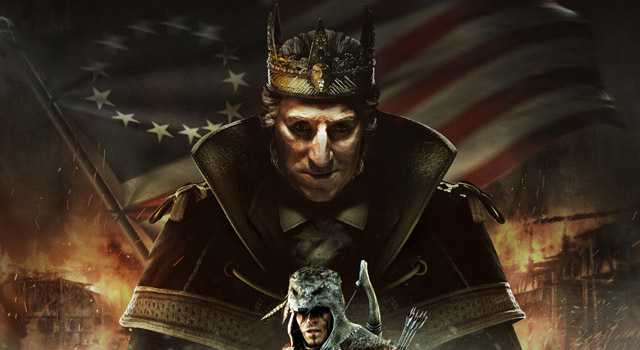 The Tyranny of King Washington DLC takes place in an alternate world where Connor never becomes an Assassin or takes part in the American Revolution War effort. This means that he keeps his impossible to pronounce name Ratonhnhaké:ton, and never doubles up on Paul Revere’s horse for a lovely midnight ride. As the war comes to a close in the DLC George Washington makes a grab for ultimate power over the new nation. This forces Ratonhnhaké:ton to endure a new set of trials as he sets off on a journey to dethrone King Washington and “deliver justice in the newly-founded United States of America”. The alternate history downloadable content has been broken up into three episodes, starting with the release of The Infamy next month, and it is part of the $29.99 (2400 Microsoft Points) Assassin’s Creed III Season Pass. The first episode is also available as a single DLC purchase for $9.99 (800 Microsoft Bucks), which means you will end up paying $30 if you buy all three DLC packs separately. Considering the hefty price tag, we are assuming/hoping that each episode of The Tyranny of King Washington will be significantly longer than the Benedict Arnold missions that were included in the PlayStation 3 version of Assassin’s Creed III. We will keep an eye out for any additional details about Assassin’s Creed III‘s The Tyranny of King Washington DLC leading up to its release next month. In the mean time you can get your first taste of the add-on in its debut trailer, and check out the press release below for more information. MONTREAL — January 24, 2012 — The time draws closer to fight for justice against a revolutionary turned tyrant in Assassin’s Creed III newest adventure, the Tyranny of King Washington. The Infamy, the first episode of a three-part tale, will be available on Microsoft’s Xbox 360® video game and entertainment system, and Windows PCs on February 19 and on PlayStation®3 computer entertainment system on February 20. The three upcoming episodes of the Tyranny of King Washington are available through the Assassin’s Creed III Season Pass, which is available for purchase for 2400 Microsoft Points on Xbox LIVE or $29.99 on the PlayStation® Network and Windows PC. The first episode, The Tyranny of King Washington: The Infamy, can be purchased as a single DLC pack for 800 Microsoft points or $9.99. Following The Infamy, The Tyranny of King Washington will continue in two additional content packs that let gamers experience an alternate history of the events following the American Revolution. All Assassin’s Creed III downloadable content packs will also be available on the Wii UTM.